Following on from Ben Fogle’s launch of the new episodes of Ben10 on Cartoon Network and night in Grandpa Max’s Rust Bucket we were invited to Swiss Farm Touring and Camping in Henley-on-Thames to experience them both for ourselves. The Rust Bucket was instantly easy to spot with its distinctive racing stripes, signature markings, roof rack and headlights – well before we were close enough to read the Ben10 signs. 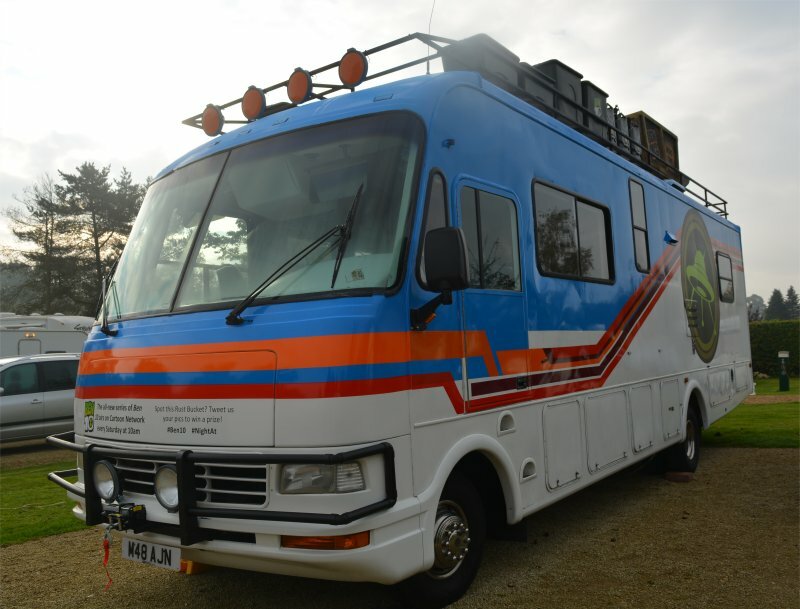 This holiday home on wheels is used by Ben, Gwen and Grandpa Max as they travel around fighting villains. Inside has been kitted out just like in the Ben 10 series and so my sons instinctively knew how to put the stairs in and where to head for the toilet! There’s a bit of rust on it… but that’s all part of the charm. As well as a working toilet the Rust Bucket features a working shower (and obviously water and electric hook-up to the campsite), state of the art gas hob, fridge freezer, microwave oven, kettle and sink (it was just lacking a plug!) as well as a television and Playstation 4 meaning that the boys could enjoy the new episodes of Ben10 being shown every Saturday and Sunday at 10am on Cartoon Network (Sky Channel 634; Virgin Media Channel 704; BT Channel 486 ; TalkTalk Channel 486) or enjoy a game of Fifa17. 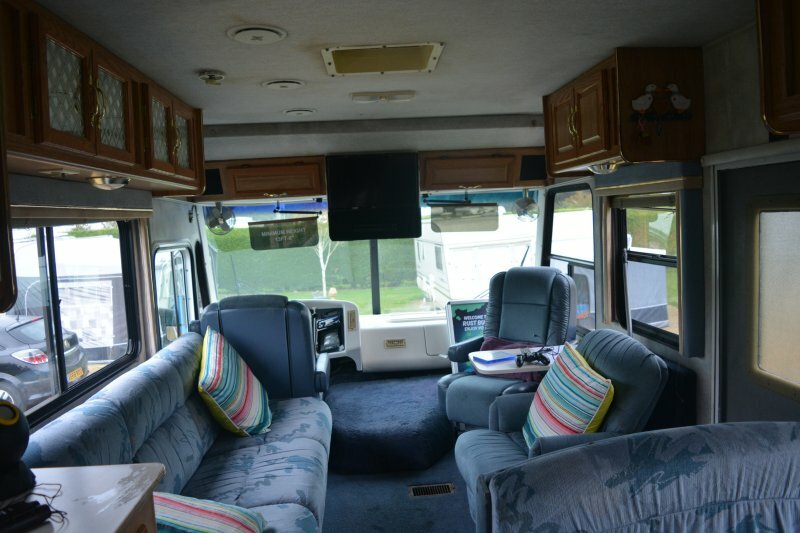 There is a spacious lounge with sofa plus a dining table – both of which convert into beds. This means there is plenty of room for plotting the next adventure, enjoying one of the board or card games and using your Ben tuition to spot pesky creatures causing trouble in the area with Grandpa Max’s Binoculars and the Galactic Explor-o-Scope. There is also a main bedroom with double bed and a mattress perfect for bouncing on – but everyone needs to be asleep by 11pm as Swiss Farm Campsite has a strict no noise policy which is enforced. There are lots and lots of places to hide and store things – and Grandpa Max and Gwen have left their clothes behind in one cupboard! We headed there after work on a Friday evening and the children were very excited. As we arrived late the reception was closed but our host Patrick was there to meet us and show us to the RV. He explained everything in great detail and also left us instructions plus concise instructions. We received a Hamper full of goodies including Ben10 Merchandise and the new DVD. 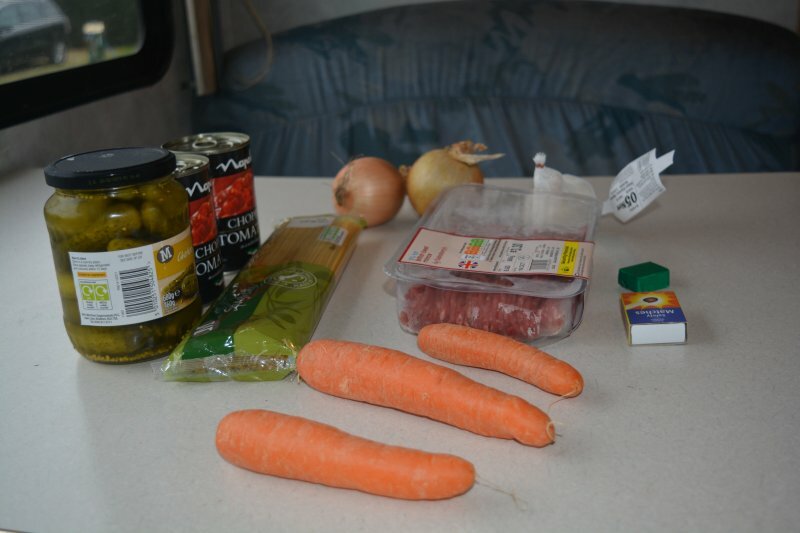 We also had all the ingredients required to make Ben’s favourite recipe Rust Bucket-Naise using Goat’s Bear and Piranha Liver. We had a great night and the children really enjoyed themselves. The Rust Bucket came with board games and the boys enjoyed using the football and going over to the park. Unfortunately it was a flying visit as we already had commitments but will be sure to return to Swiss Farm Camping where the staff were lovely. 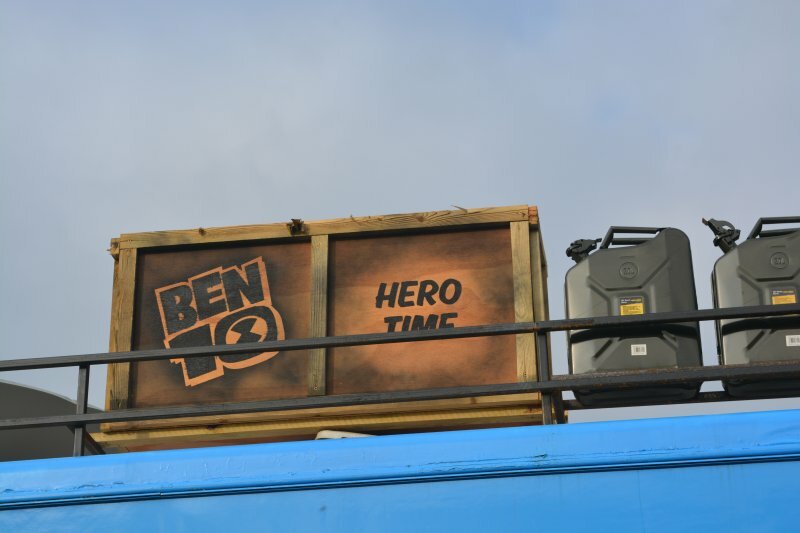 Ben 10 is aimed at children ages 6-12 years old and is about a 10 year-old wide-eyed and adventurous boy called Ben Tennyson, who discovers an out-of-this-world alien-morphing watch – the Omnitrix – while on summer holidays with his grandpa Max and cousin Gwen. My family and I were invited to a night at the Ben 10 Rust Bucket and were given a pizza voucher, a hamper and a nights stay. All opinions are honest and my own. Oh this sounds brilliant! I do love a camper van and the idea of having one based on a favourite children’s character is perfect! I’m glad you had a fun night.